We have invested in a number of Marty robots. 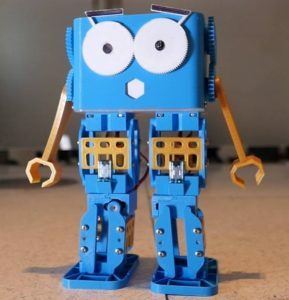 These little robots are programmed in a range of languages and can be upgraded with a microbit or raspberry pi to include further functionality. They can also be personalised with three D printed parts. They will help you upgrade from Scratch to Python, and learn ROS and v-rep robotic operating systems. We are planning a Marty “Buildathon” Event on Monday 15th October and then the challenge is over to you to see what you can get them to do. Five-a-side football anyone?